Army Institute of Nursing, Guwahati Recruitment 2018 August- Associate Professor,Tutor, Storekeeper Posts :- Army Institute Of Nursing, Guwahati has published a recruitment notification for August 2018. According to the latest Army Institute Of Nursing, Guwahati Recruitment 2018 advertisement, Army Institute of Nursing, GHY invites applications from suitable candidates for filling up Associate Professor , Tutor and Storekeeper Posts. We have detailed information shared in below section. 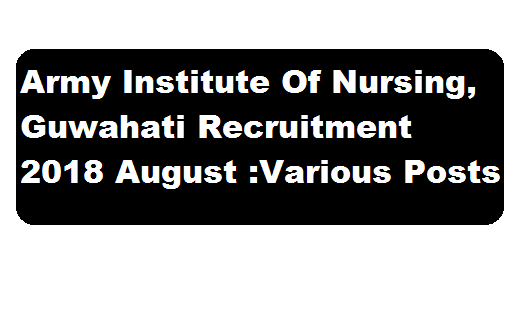 In this section, we will discuss in detail about Recruitment for different posts under Army Institute Of Nursing, Guwahati Recruitment 2018 August with all the details and requirement. Educational Qualification: M.Sc (N) with 08 years experience including 05 years teaching experience. PhD (N) desirable. Educational Qualification: B.Sc Nursing with minimum 01 year experience. Educational Qualification: XII passed or equivalent. ESM SKT(Nk/Hav) and civilian with minimum 3-5 years of experience as storekeeper. Application with connected documents duly completed along with with two passport size photographs be forwarded to Army Institute of Nursing, C/O 151 Base, Basistha, Guwahati, Assam, PIN- 781029 by 31st August 2018.